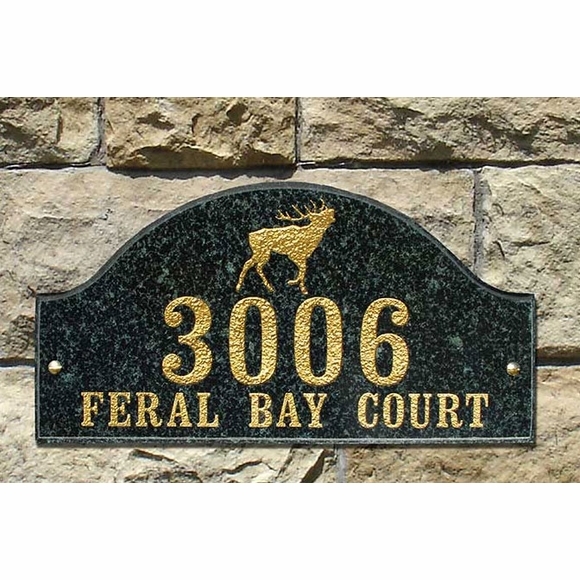 Personalized Wildlife Address Plaque - - Solid granite address sign with wildlife image: a bear, elephant, elk, moose head, lion, rhino, or wolf. Plaque is custom made with your choice of shape, granite color, letter/animal color, and font style. Wildlife logo is the same color as the letter color you select. Personalized with one or two lines of deeply engraved numbers or text. Maximum character count on each line of text is 15 (including spaces and punctuation). Please type your text exactly as you want it to appear. You can use both upper and lower case letters. In addtion, you can use a different font on each line as shown above. If you want 1 line only, please leave the Line 2 input box empty. Wall mount or attach to a set of lawn stakes (sold separately; see Related Products). Mounting hardware for wall installation included. Granite colors: black, emerald green, sand granite. Letter/dog colors: black, white, mocha, gold. Black granite: gold or white text. Emerald green granite: gold or white text. Sand granite: black or mocha text. Fonts: clarendon, century bt italic, times roman italic. Logos: bear, elephant, elk, moose head, lion, rhino, wolf. Dimensions oval: 15"W x 7"H x 1"D; weighs 3.5 pounds. Dimensions rectangle: 13"W x 7"H x 1"D; weighs 3.5 pounds. Dimensions arch: 15"W x 7.5"H x 1"D; weighs 4 pounds. Solid granite wildlife address sign made just for you. It looks great. Wonderful wedding present for new couples house. Great quality, meticulously crafted, well designed and sturdy packaging. I am very pleased with the wildlife address plaque. I am sure it will outlast the house it is attached to! I will keep comfort house on the top of my list for home shopping sources.